Digital Alloys, Inc., Burlington MA, provider of metal additive-manufacturing (AM) technology, has announced a $12.9-million Series B round of financing led by G20 Ventures, Boston, MA, and joined by Boeing HorizonX Ventures, Chicago, IL, and Lincoln Electric, Cleveland, OH. The company uses wire feedstock and high deposition rates to print metal parts, reportedly at low cost. Read more. Honda's Aircraft Engine Research and Development Center has selected GE Additive's AddWorks team to provide consultative services, with the goal of accelerating applications of AM in the aerospace sector. Read more. 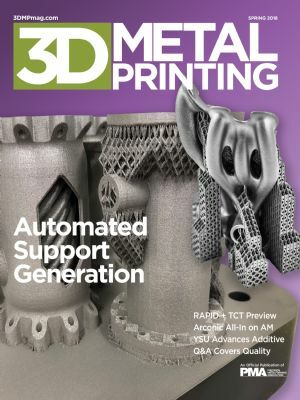 ...is an additive manufacturing design tool and software suite that simulates the 3D printing process, for both polymers and metals, to accurately predict the deflection, residual stress, damage initiation, and crack growth formation associated with as-built AM parts. Advanced Multi-Scale Progressive Failure Analysis methods are used to replicate the entire 3D printing process from the level of Material Characterization to Advanced Structural Analysis in order to determine voids, delamination, manufacturing anomalies, and other irregularities and inefficiencies from micro to macro scales. More significantly, GENOA 3DP Simulation provides the end user with the ability to import or generate a structural mesh, run an analysis, identify material and process parameter sensitivities and optimize the AM build in order to reduce waste. reduce weight, improve performance and meet specification. Click to Watch AlphaSTAR's latest webinar to identify how GENOA3DP can help AM part production. A new study looks at the utilization of hybrid manufacturing in the United States, as well as the locations of AM hubs and potential places for hubs to complement traditional machine shops. Read more. 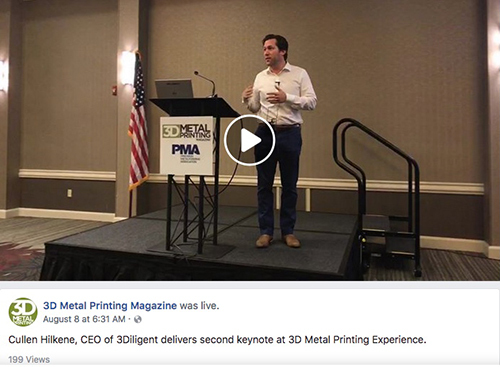 During last week's 3D Metal Printing Experience and Tech Tour in Pittsburgh, PA, Cullen Hilkene, CEO of 3Diligent, provided a high-level overview of the most common metal-printing processes. Check it out. Last Call! August 16—Webinar, Identifying Parts for Additive Manufacturing. Speaker: Kyle Adams, application specialist, SLM Solutions NA. Attendees will gain an overview of how to assess their components in taking the first steps toward implementing a metal-AM strategy. Register. August 23—Webinar, How Metal Additive Manufacturing Delivers New Efficiencies in Lightweight Parts. Speaker: Bryan Newbrite, advanced aerospace applications leader, 3D Systems Corp. Learn to increase part functionality while reducing part weight and optimizing material usage. Register. For parts large and small, this iconic manufacturer is developing materials and techniques to forward the technology and feed its aerospace customers. Ben Staub, president of BasTech, provides real-life examples where metal AM makes sense for toolmaking. ☉ Successful Missile-Part Simulation—This project proved out simulation in supplying a cost-effective AM part for the U.S. Missile Defense Agency. ☉ 2018 AMUG and Rapid + TCT Offered Plenty—New printer technology, quality-control systems and software, and a whole lot more.